Launched in 1964, the War on Poverty quickly took aim at the coalfields of southern Appalachia. There, the federal government found unexpected allies among working-class white women devoted to a local tradition of citizen caregiving and seasoned by decades of activism and community service. Jessica Wilkerson tells their stories within the larger drama of efforts to enact change in the 1960s and 1970s. She shows white Appalachian women acting as leaders and soldiers in a grassroots war on poverty--shaping and sustaining programs, engaging in ideological debates, offering fresh visions of democratic participation, and facing personal political struggles. Their insistence that caregiving was valuable labor clashed with entrenched attitudes and rising criticisms of welfare. Their persistence, meanwhile, brought them into unlikely coalitions with black women, disabled miners, and others to fight for causes that ranged from poor people's rights to community health to unionization. 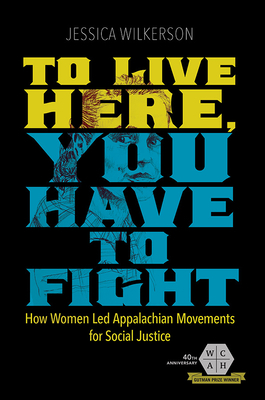 Inspiring yet sobering, To Live Here, You Have to Fight reveals Appalachian women as the indomitable caregivers of a region--and overlooked actors in the movements that defined their time. Jessica Wilkerson is an assistant professor of history and Southern studies at the University of Mississippi.